There may come a time in our lives that we may not be able to convey our own decisions about our future medical and health care. Advanced thoughtful consideration may be necessary in the form of a living will to express your wishes for future medical care and life-sustaining treatments you would like to receive if you were terminally ill. It is important to note that a living will does not let you choose another person to make health care decisions for you. A durable power of attorney for health care or advanced health care directive is the correct form for this. A Living will form is a formal legal document that specifically explains how you would like to have your health care treatments carried out, at a time you are not able to speak for yourself or when you are terminally ill.
A living will form is important to have. If you are physically or mentally unable to speak for yourself about medical treatment options you want or are opposed to, a living will form will let doctors and family members know exactly what your medical treatment preferences are, and what types of medical care you are opposed to. Must I Have a Living Will? It is not mandatory or required by law to have a living will. However if you cannot speak for yourself and you do not have a living will, another person, doctor, or court will end up making health care decisions for you if you are unable to. At a minimum, most people should have a living will form filled out indicating what their health care wishes are. If you want to appoint another person to make these decisions for you see our free advanced health care directive. 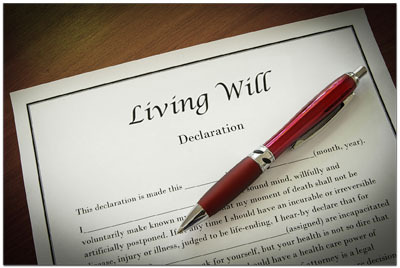 What Happens if I Don’t Have a Written Living Will Form? Not having a written living will form will not allow you to have a say about health care treatment and or preferences should you be unable to communicate yourself. If you do not express your wishes in writing about how you want to be treated there is always the possibly that you will be treated medically in a way that you never intended. It is likely decisions about your care will be made by someone else, or sometimes the court.